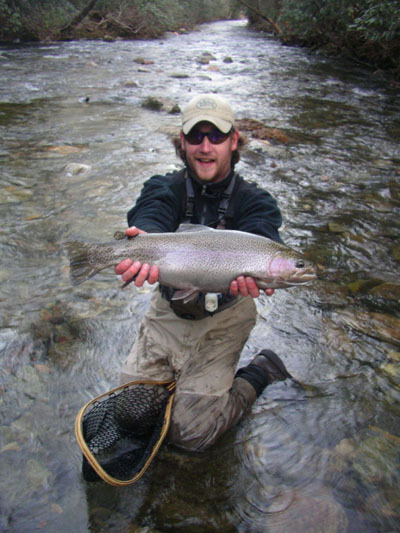 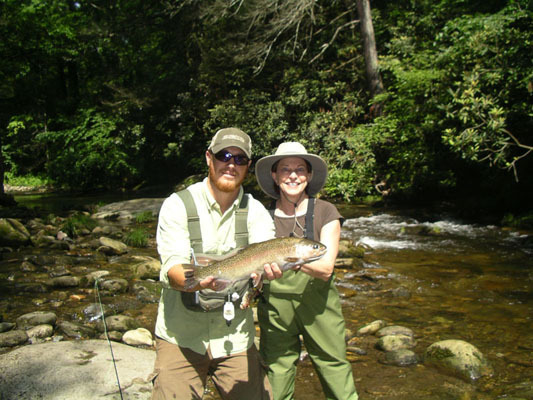 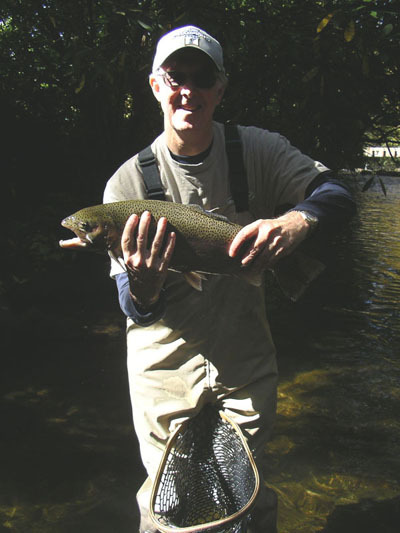 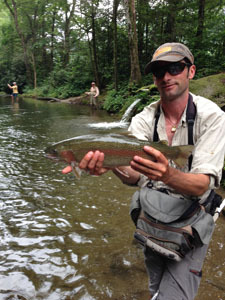 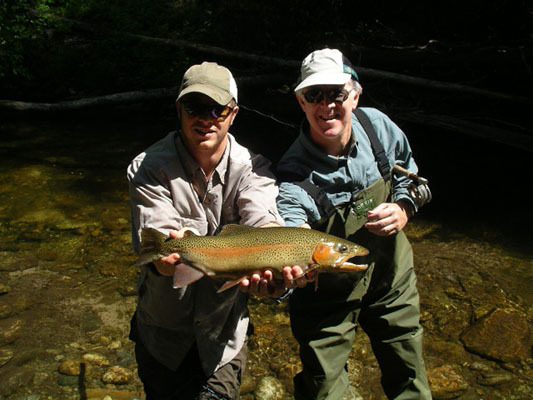 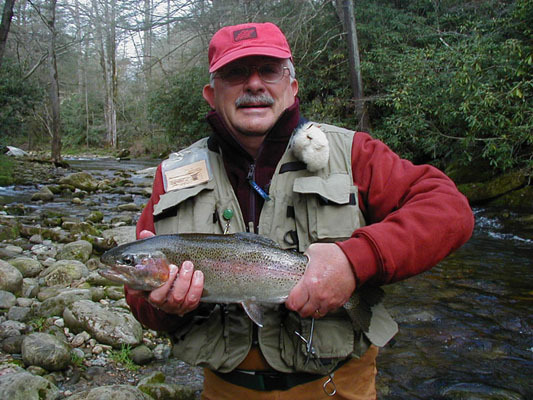 Bill Butler caught this nice Davidson River rainbow trout--held by Altamont Anglers guide Travis Honeycutt--on July 27, 2013 (click for full view). 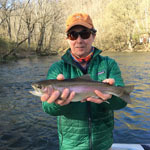 The most interesting element of the picture of that big rainbow is the background, and what it says about current conditions on the Davidson River. 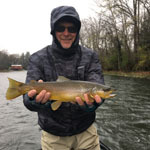 The torrential rains that have dogged us for the past month or so, causing cancelled fishing trips, flooding, and decaying garden tomatoes have mostly abated in the past week or so, and flows on most streams are now manageable, wadeable and fishable. 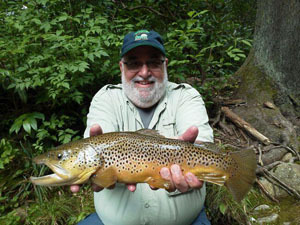 In fact, some benefits from all that high water are now evident: the fish on the Davidson River are spread out throughout the stream, they are feeding happily in the sense of security provided by the still-high (but fishable) water, and they've been a little rested from the normal fishing pressure as anglers have largely stayed away from the flooding. 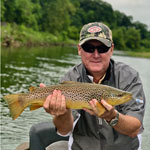 All of these benefits accrued to Bill Butler and his friends on Saturday, July 27 as they waded under the guideance of Altamont Anglers guide Travis Honeycutt, catching and releasing some well-fed Davidson River beauties. 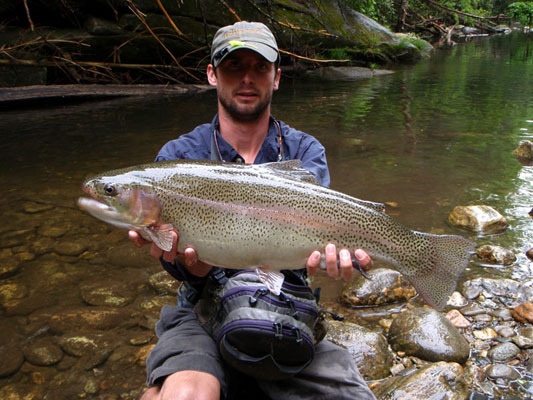 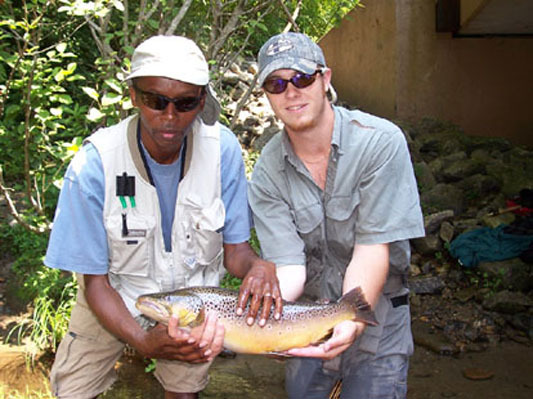 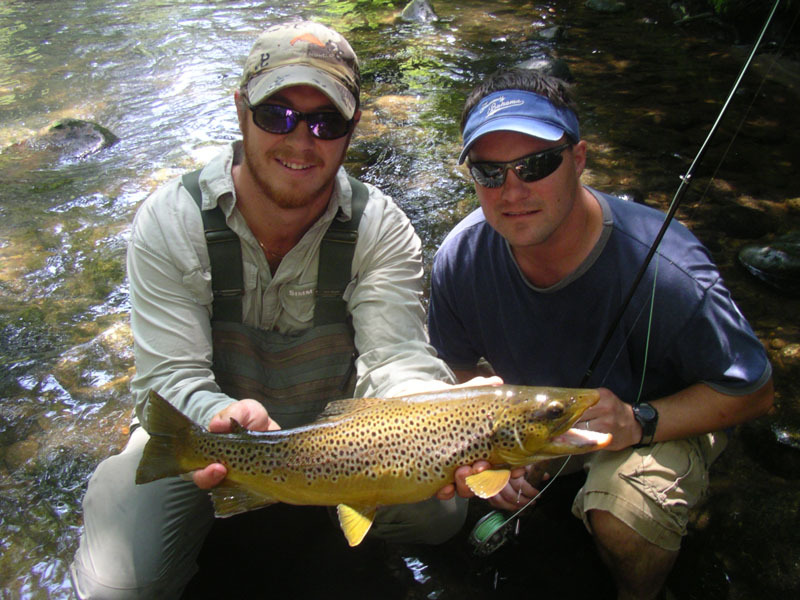 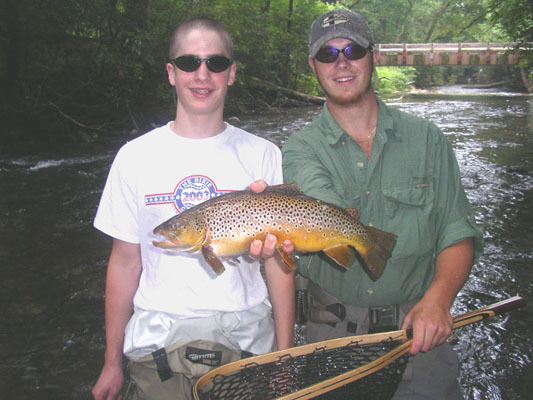 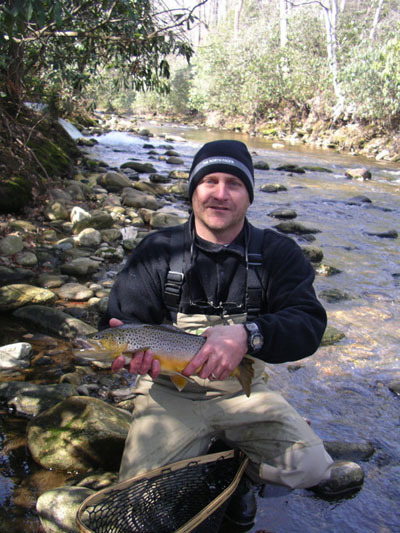 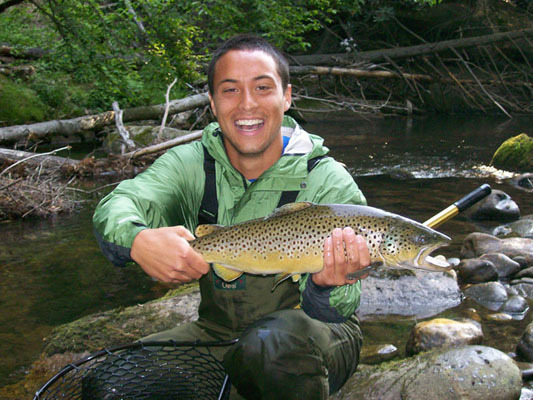 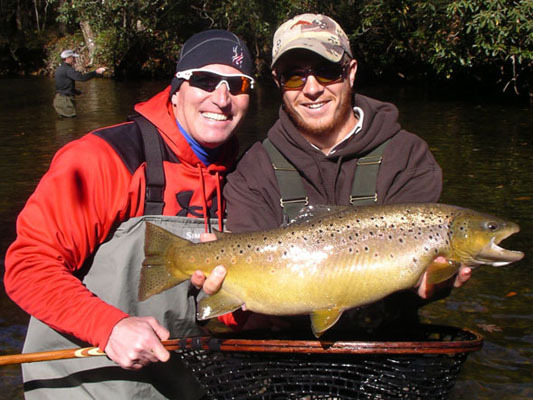 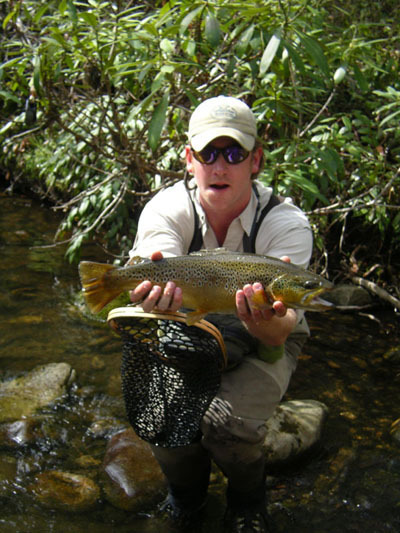 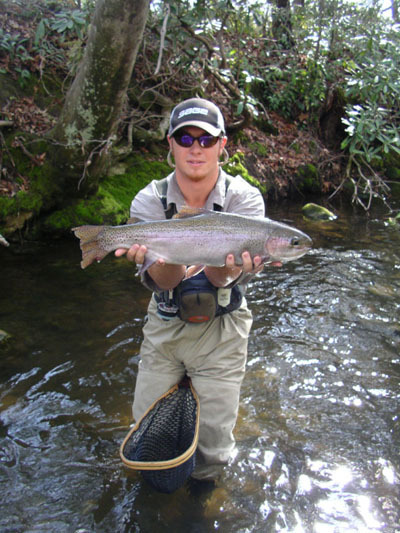 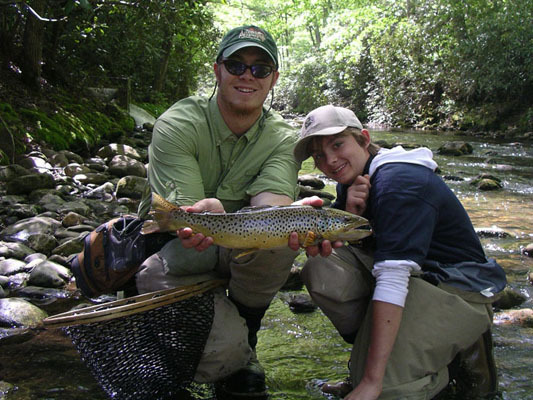 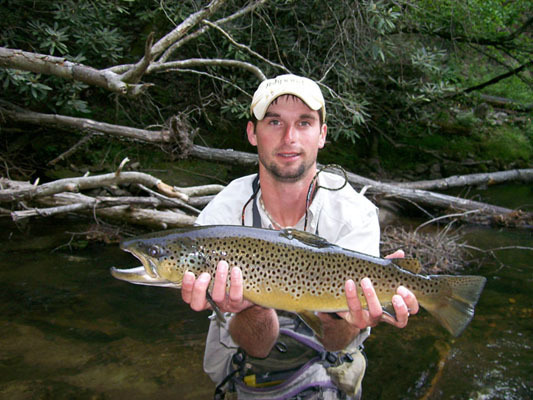 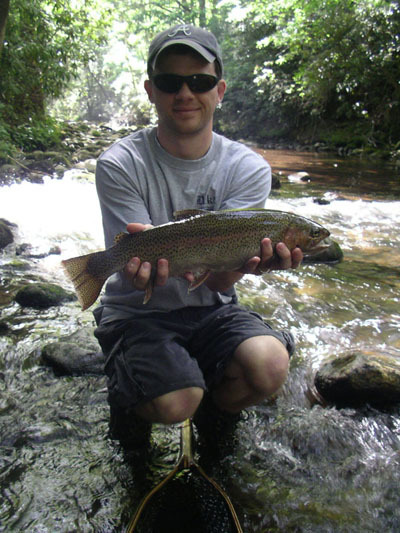 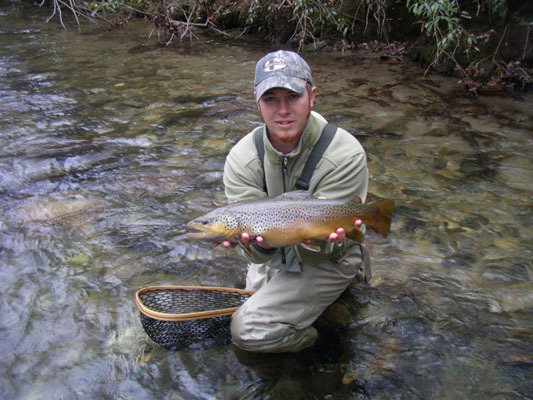 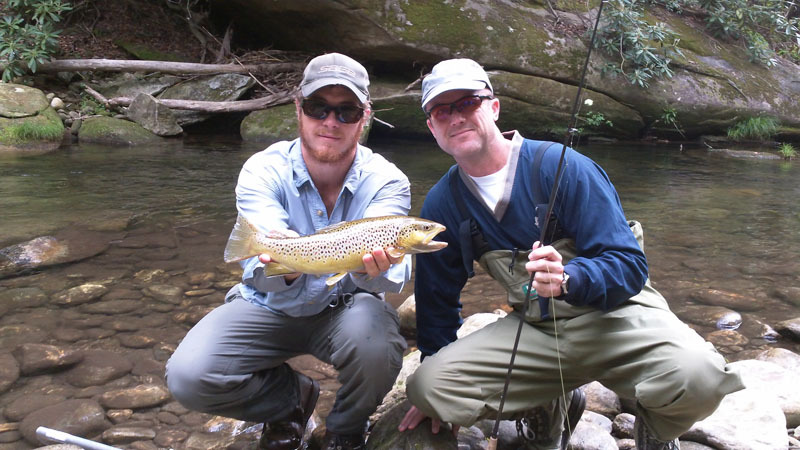 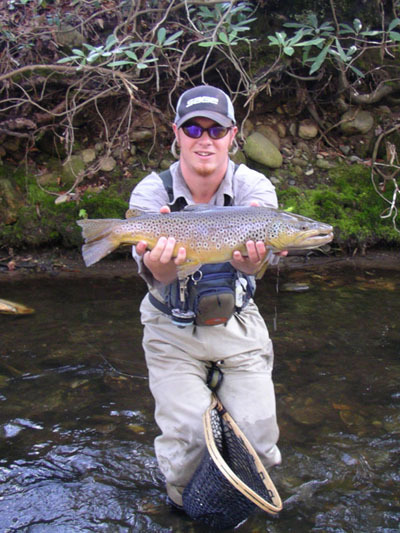 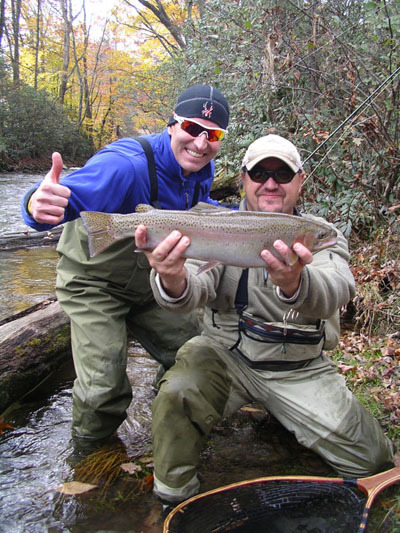 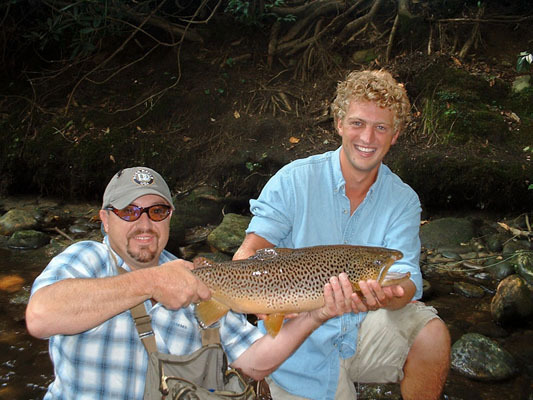 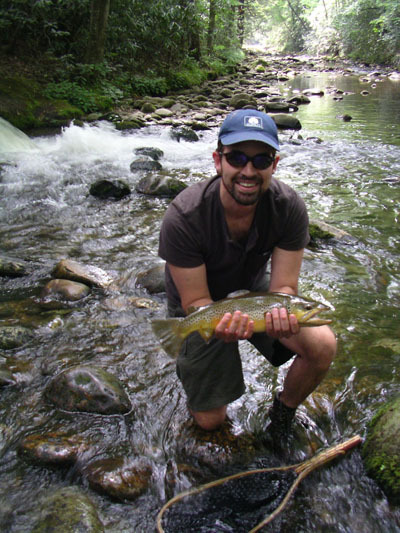 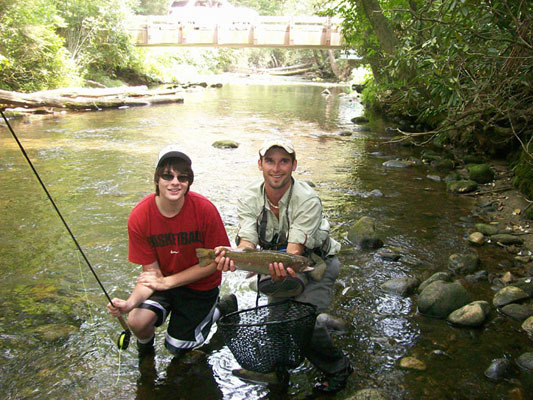 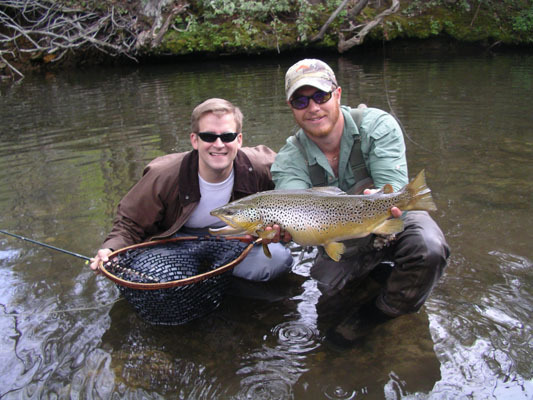 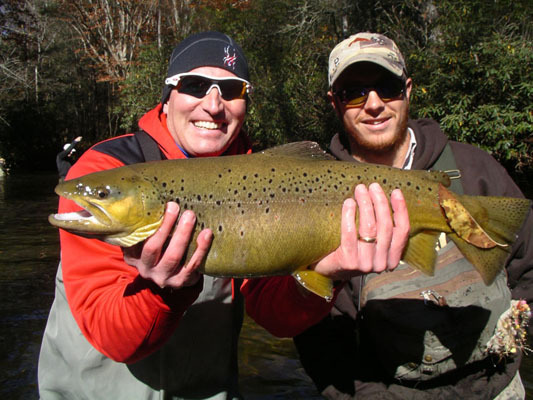 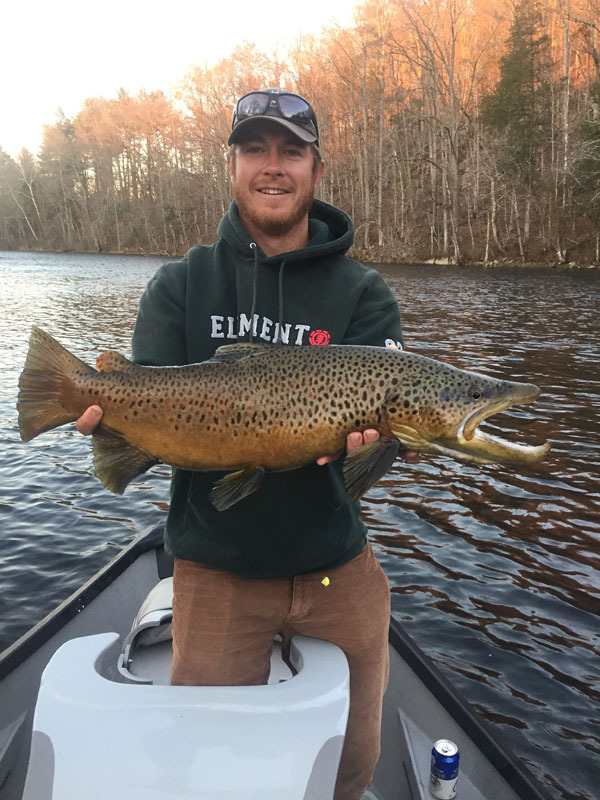 Jonathan Kusnitz with a big Davidson River brown trout (click for full view). 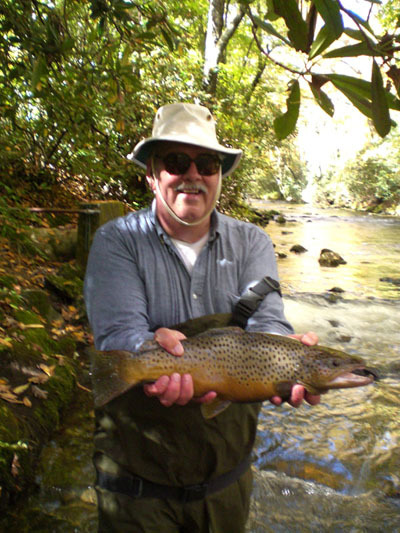 The Davidson River suffers as much as any other free-stone stream in Western North Carolina from the vagaries of Mother Nature, shrinking to a trickle during periods of drought and rising massively during heavy rains. 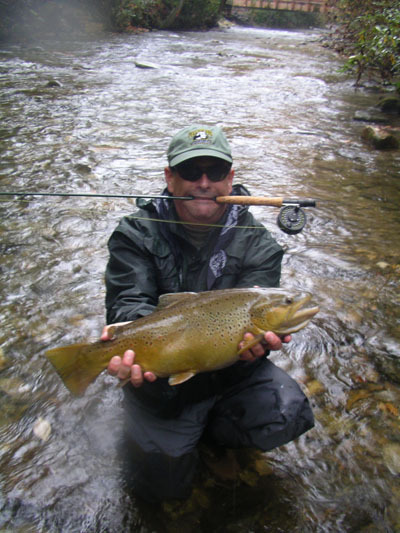 And heavy rains have been the constant condition for most of 2013 (fishing guides have been trading their drift boats for arcs), but it's tapered off a little lately, and careful wading is possible now. 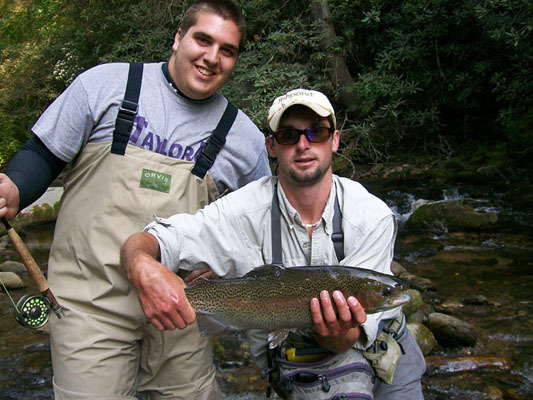 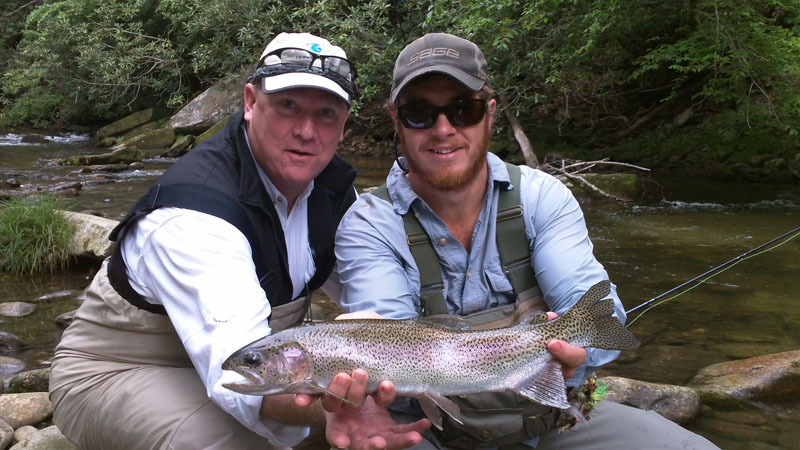 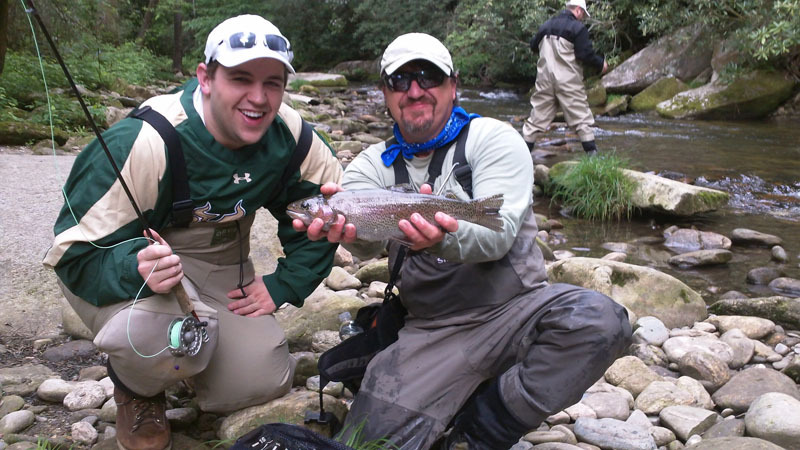 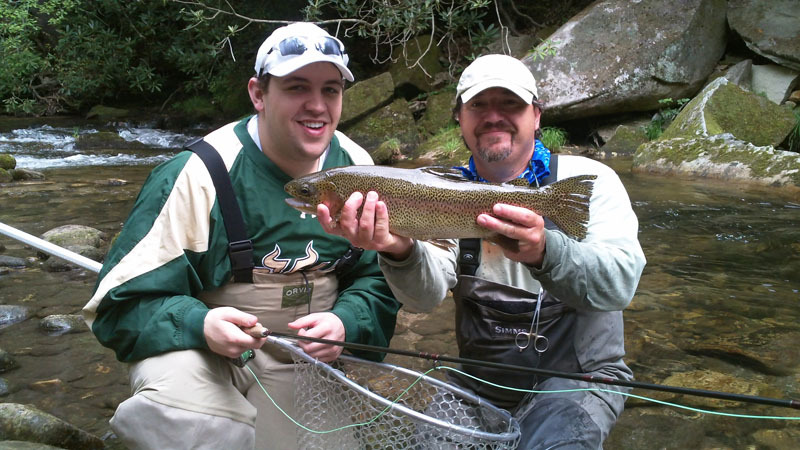 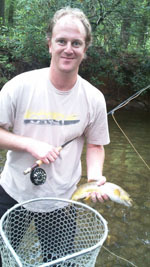 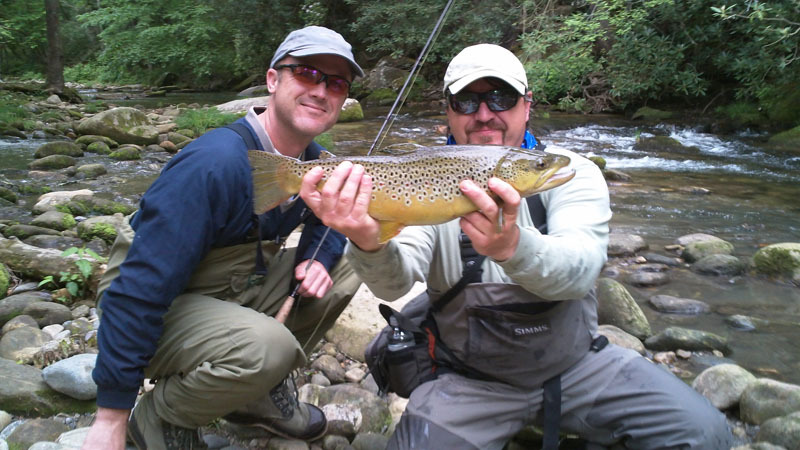 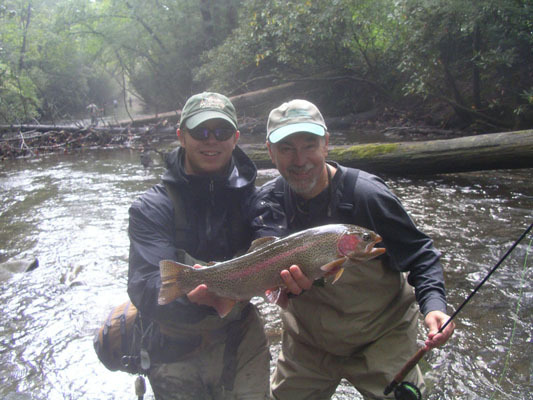 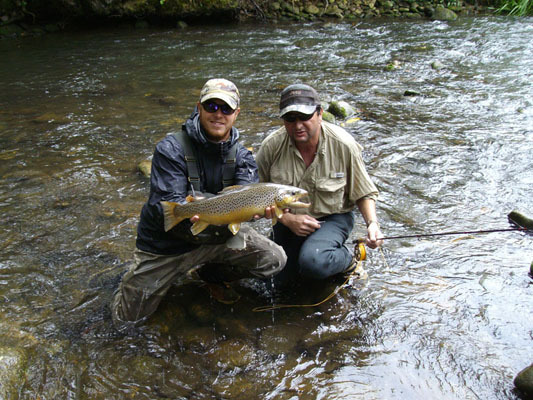 Jonathan Kusnitz booked a half-day wade trip with Altamont Anglers for Friday, July 26, 2013 and AA guide Jay Dodd targeted the Davidson River, with obviously good results, judging by the picture on the left. 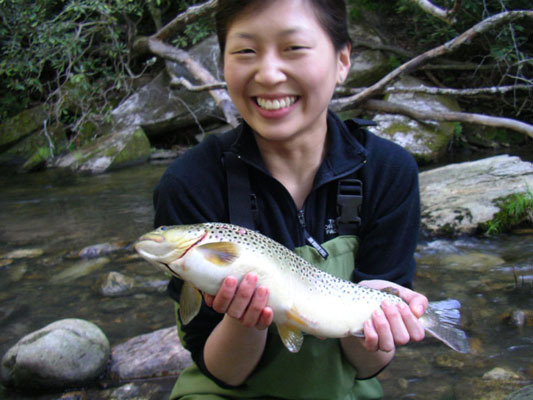 The water is high, but clear, and the fish are well spread out throught the river as a result. 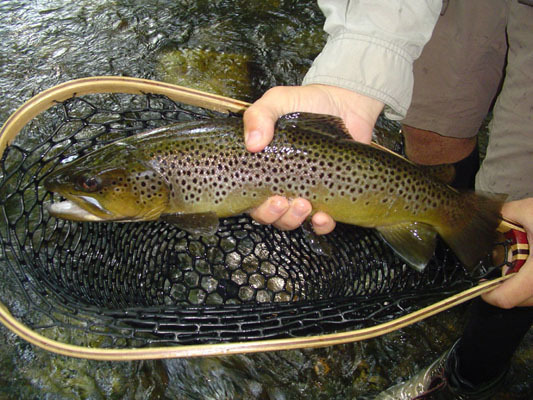 That high water has the fish feeding fearlessly and eagerly to the usual population of midges, as well as beetles and caddis flies. 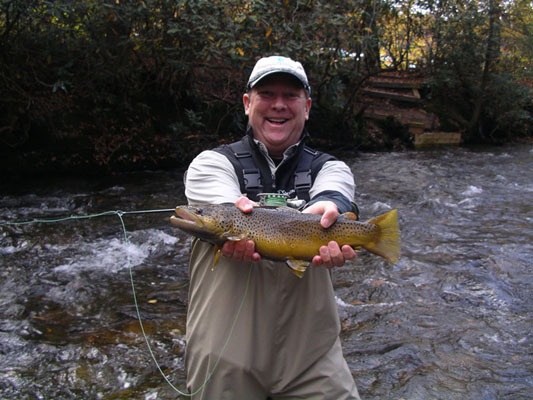 So, if you've got your high-topped wading shoes and a decent rain jacket, now's the time to hit the Davidson River! 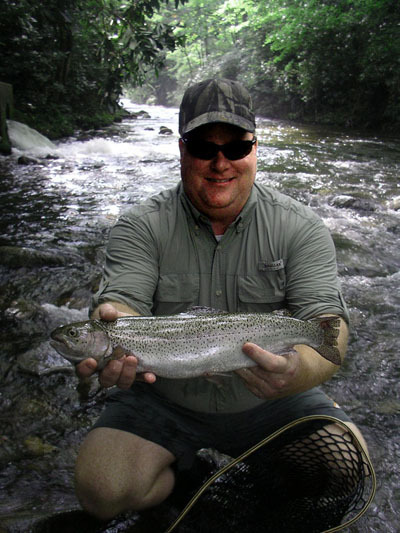 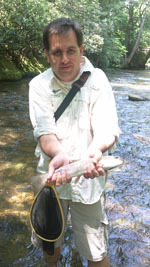 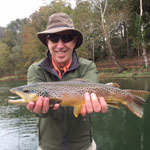 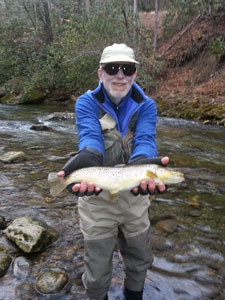 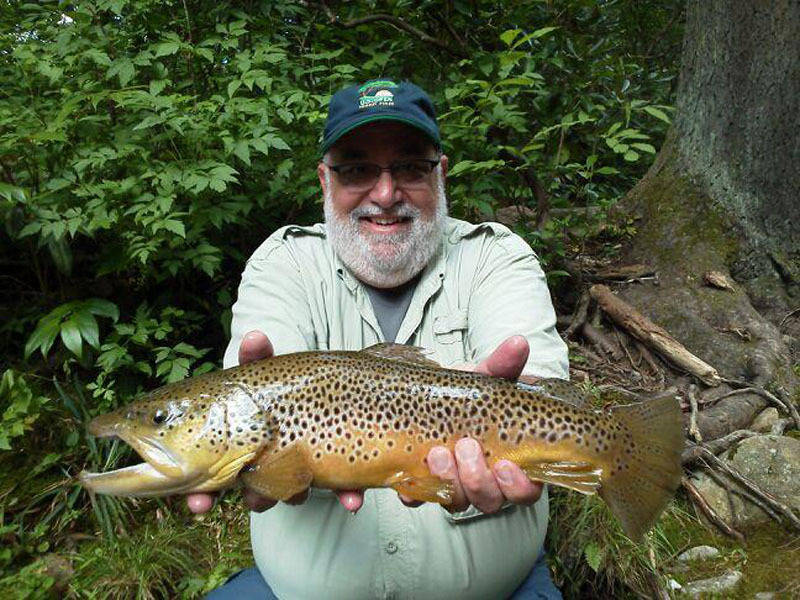 Don Hall with a big Davidson River brown trout (click for full view). 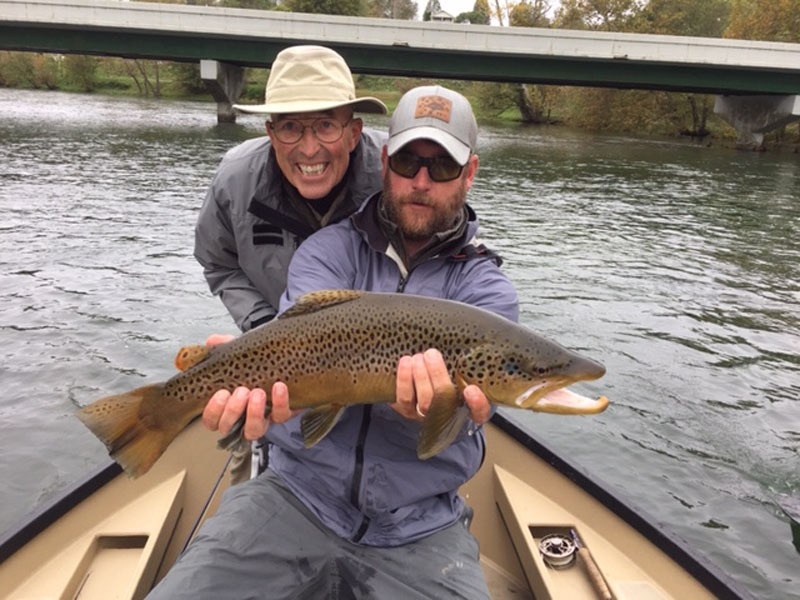 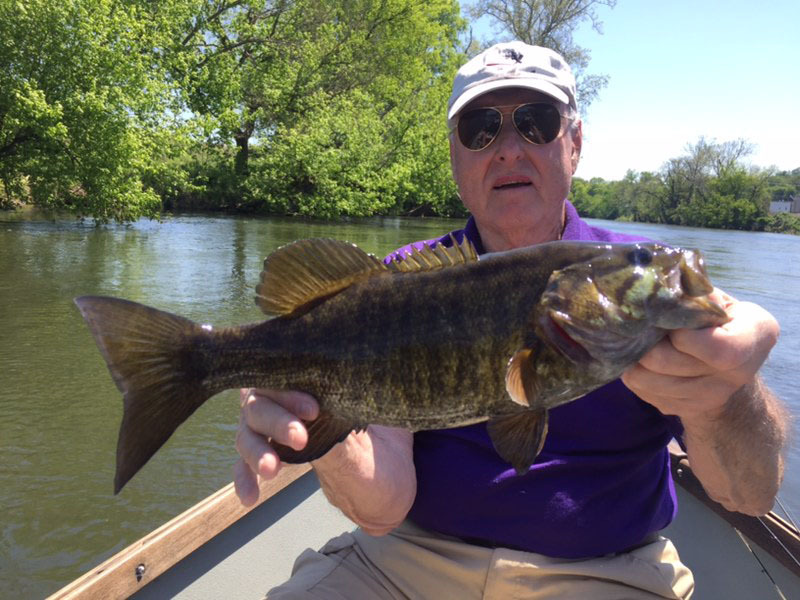 Don Hall fishes with Altamont Anglers guide Teo Whitlock a couple of days in Spring and a couple more in the Fall, usually in May and October. 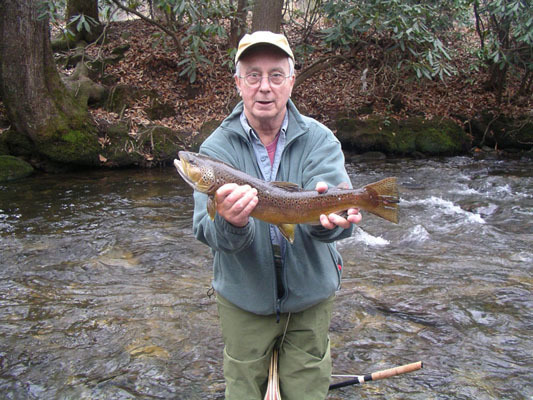 This year the Spring event happened a little early, but Don's annual assault on the trout population of the Davidson River was every bit as effective as if he'd arrived in May. 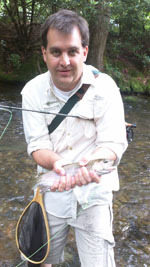 As usual, the secret to success is tiny tippets and #24 midges. 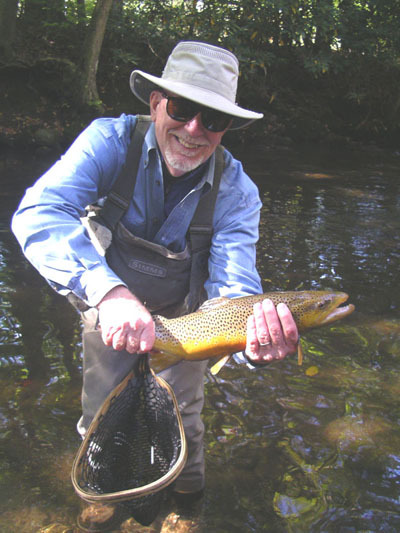 Don't forget your Caddis patterns and Blue Quills and look forward the brighter, bigger bugs of May. 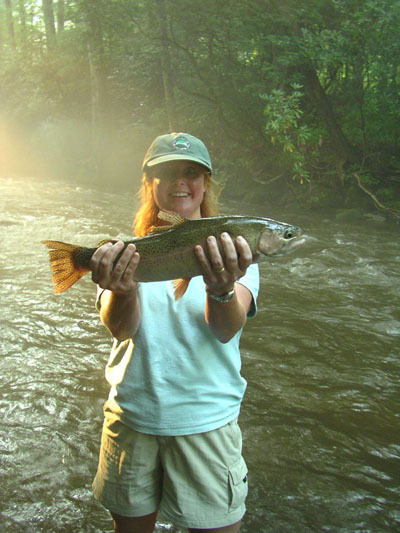 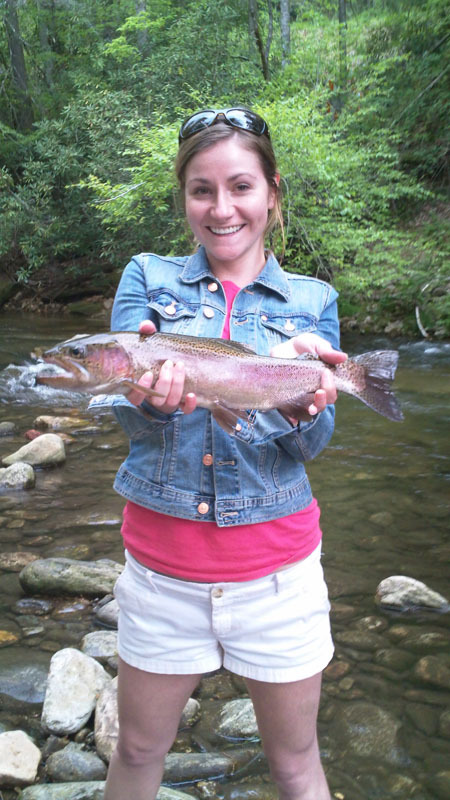 Jocelyn Turner with a big Davidson River rainbow trout caught on May 3. 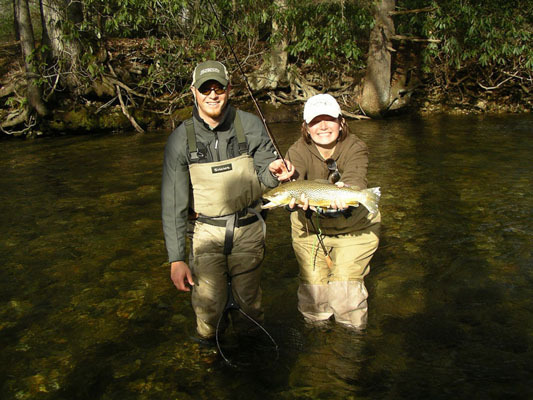 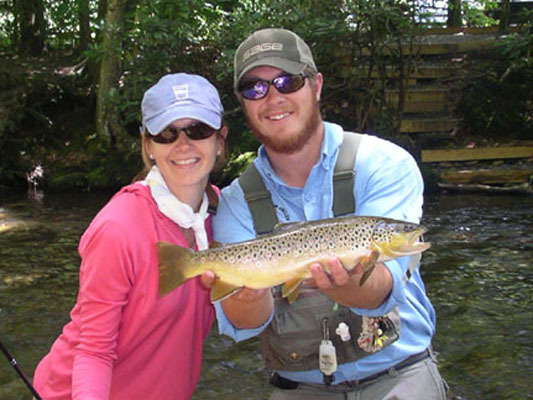 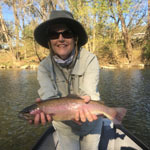 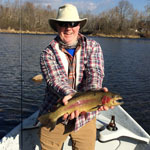 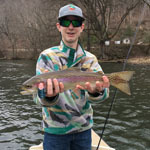 Altamont Anglers guide Teo Whitlock had a rare day off and took the opportunity to give some fly fishing lessons to his friend, Jocelyn Turner. 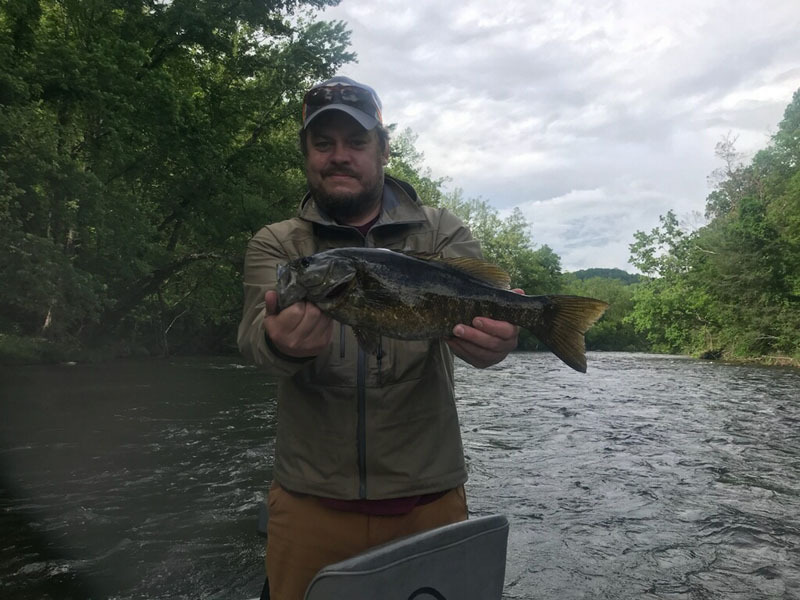 They managed to get to the river before the thunderstorm that blew the river out later in the afternoon, as you can see by the low water in the background of these photos. 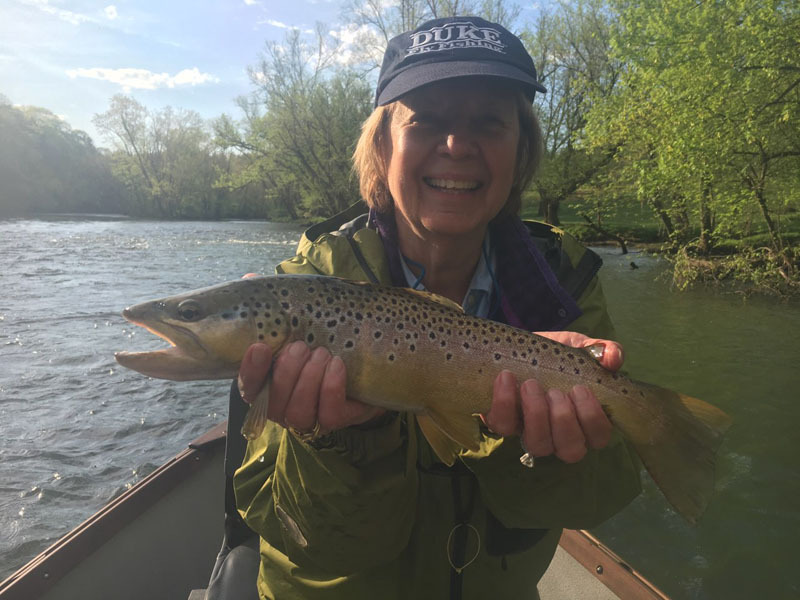 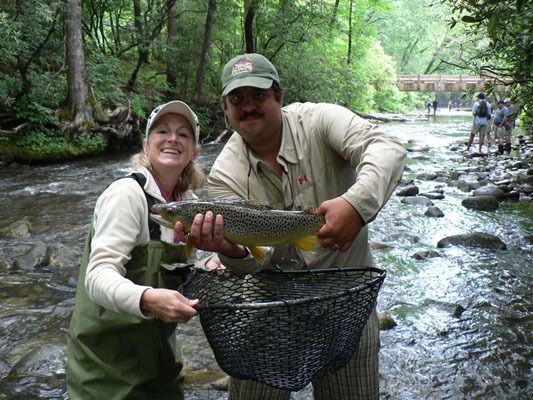 It looks like Jocelyn paid attention to her guide, or she's just a fast learner because Davidson River trout are somewhat notoriously finicky eaters and she seems to have worn them out! 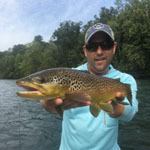 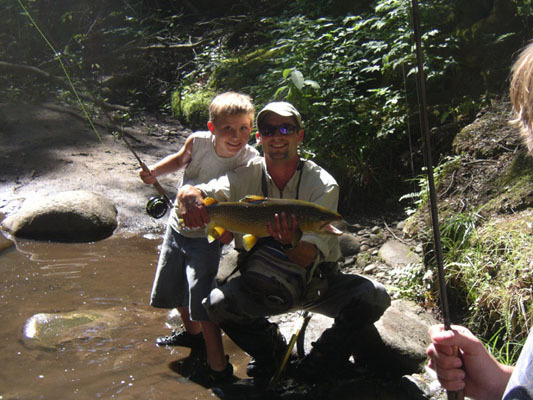 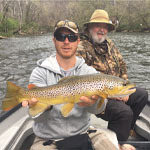 One doesn't expect first-time fly fishers to have this kind of success, but there's nothing like the knowledge and experience of a guide to tip the scales in favor of the angler. 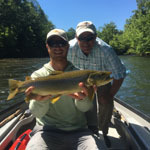 The Davidson River is back at 91cfs after the thunderstorm that spiked it up to 300cfs on Tuesday, and it's fishing great now. 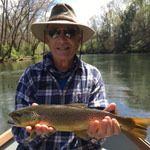 Bring your Caddis patterns, the usual midge patters, and everything else in your box if you plan to fish it--and don't forget to bring a rock of your own to stand on, because you won't be the only fly fisher in the river! 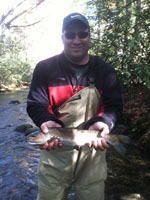 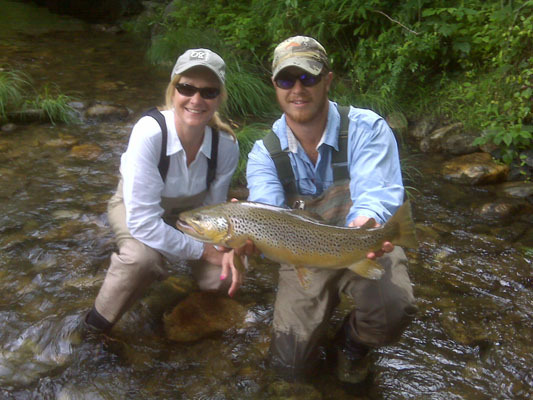 The Davidson River is once again a target for our guides and clients after the usual summer layoff. 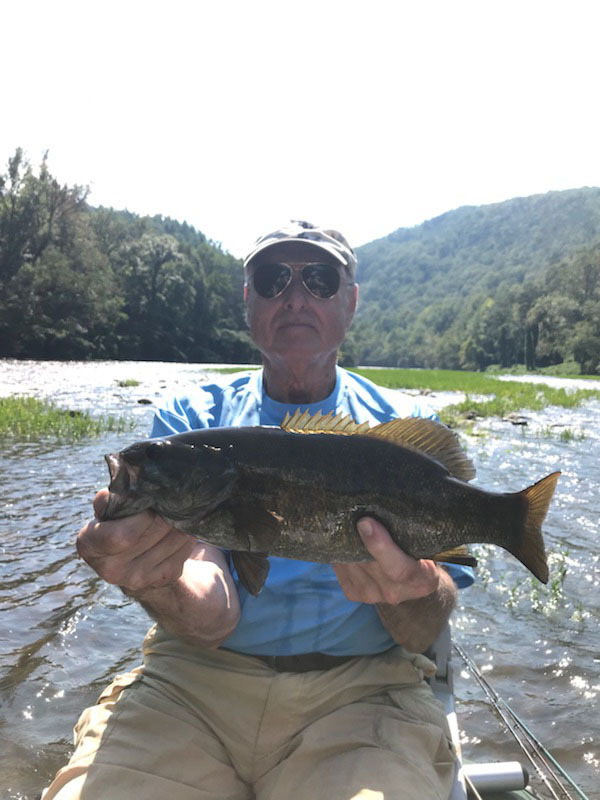 We tend to stay away when water temperatures rise in July, August and September partly to give the fish a rest and partly to avoid the crowds during vacation season. 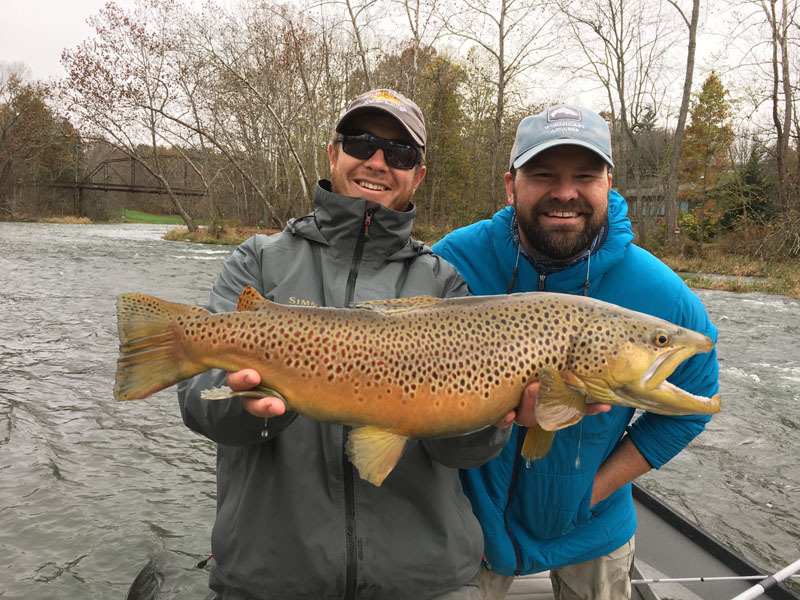 However, once Delayed Harvest season arrives we find both of those problems much reduced: water temperatures drop, making life better for the trout, and vacationers are all back in school making life better for the anglers. 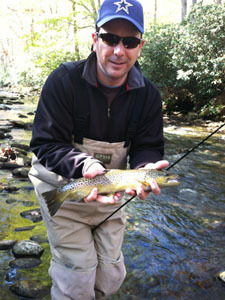 There still the omni-present midges for the trout to eat and plenty of fall caddis. 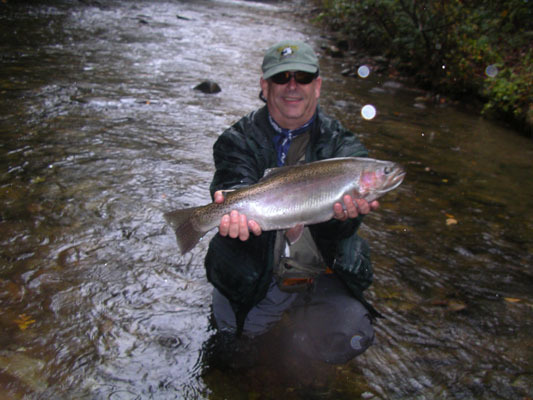 If the weather gets nasty you can expect good Baetis hatches, too. 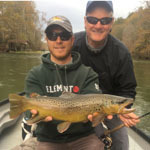 Water levels that spike up form 60cfs to 190cfs and drop back to 90cfs in about an 8-hour period gives a pretty dramatic picture of the extremes the trout--and the anglers who pursue them must endure. 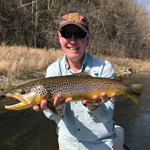 Thunderstorms terrorizing the central part of the country wind up in Western North Carolina as mostly rain-events, fortunately for us and the trout. 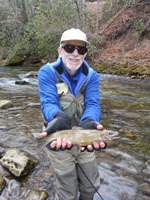 T-storms have bumedp up the water flows in the Davidson River on a regular basis this Spring, and that's been good news for fly fishing. 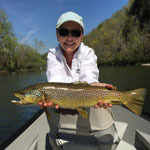 We're all hoping for a decent "Mayfly" hatch--aka Green Drake, or Coffin Fly (actually the Green Drake in its spinner faze), which peaks around Memorial Day on the Davidson River. 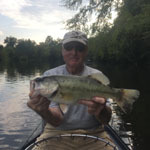 They've been rare since the floods that washed out the silt bottoms--and the hatchery bridge--several years ago, but hope springs eternal, so stake out your spot and wait for the spinners to arrive at dusk. 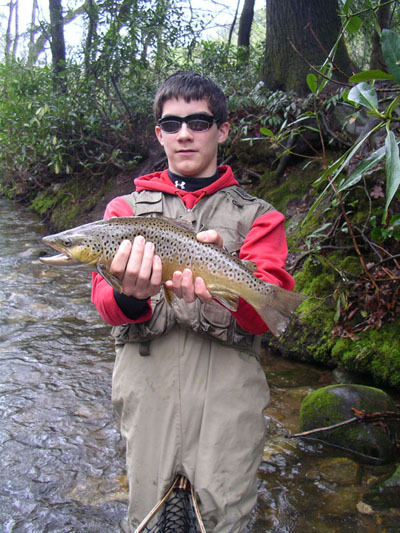 Aiden with a nice Davidson River brown trout. 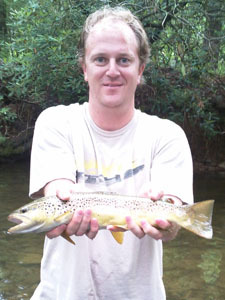 (click for larger view). First you're in a drought, then you're in a deluge--such is our fate, here in the mountains of Western North Carolina. 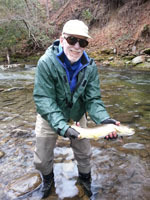 But, better a temporary deluge like the recent events than a lingering drought, which is what we flirted with this winter. 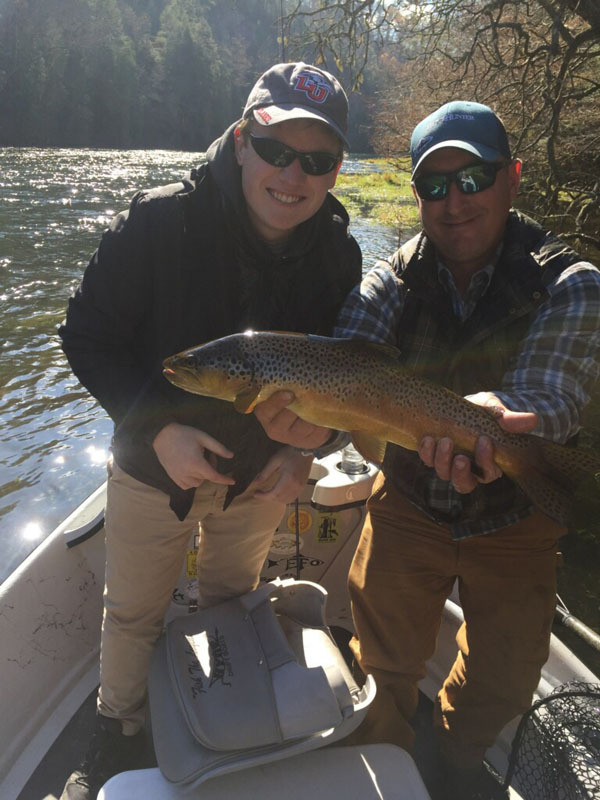 The recent rains that blew up the river over the weekend came through overnight Friday, which spared us the tornadic conditions that wasted Eastern North carolina on Saturday. 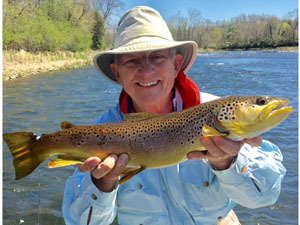 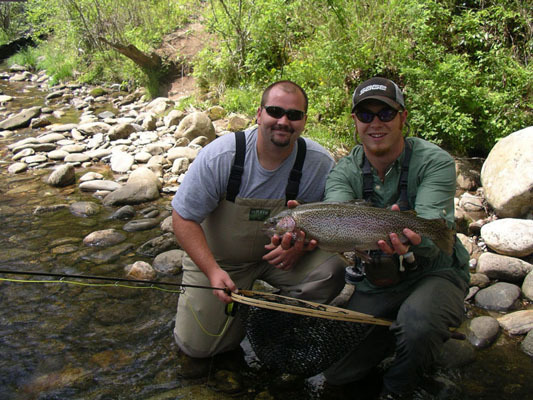 The river is back down to about 250 cfs, which is perfect for the trout and the anglers. 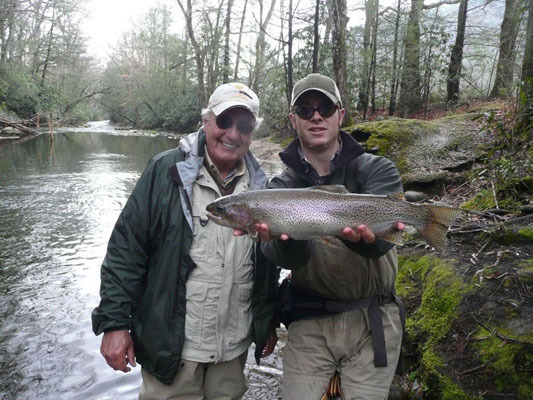 Bill McCarthy brought his grandson, Aidan, over for some fly fishing lessons Monday and Tuesday, April 18 & 19, and from the picture above it looks like he learned a thing or two! 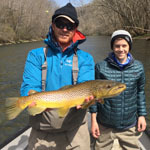 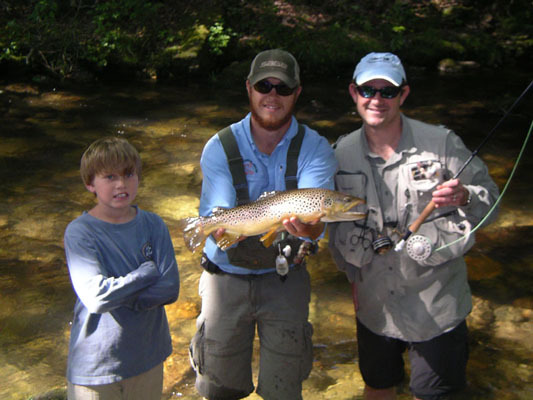 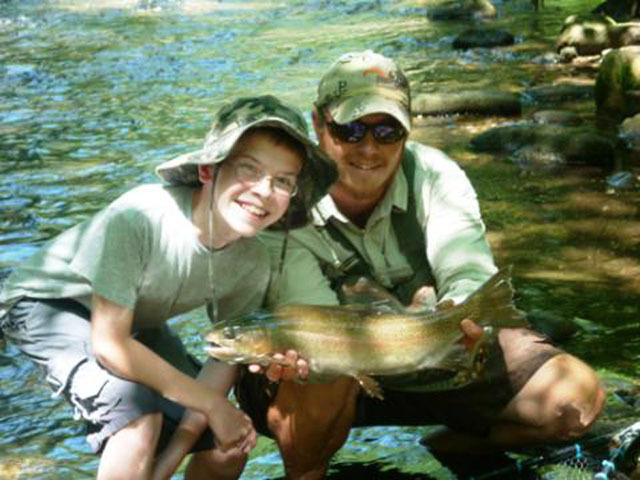 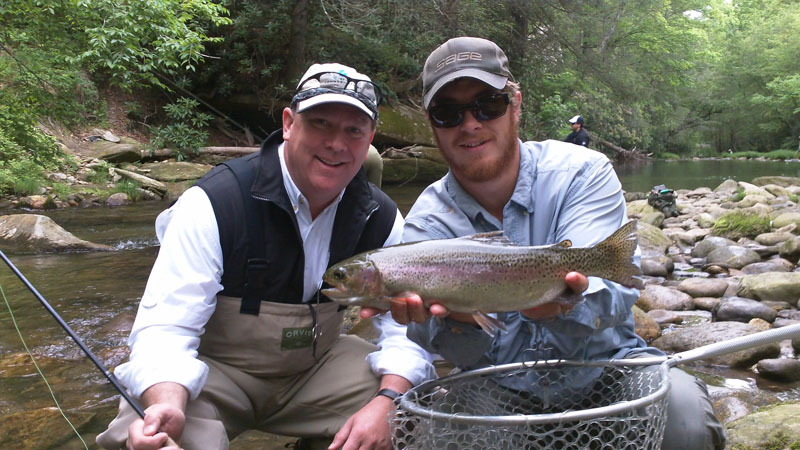 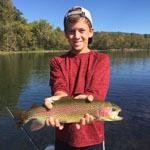 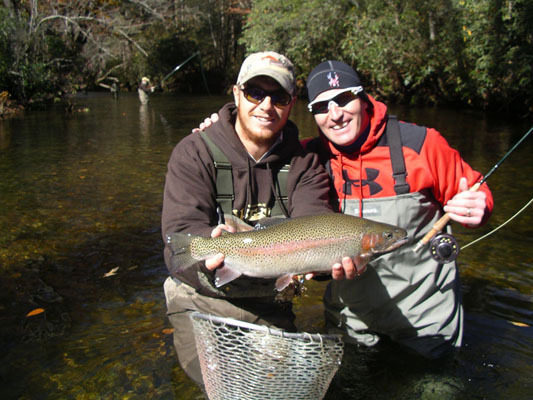 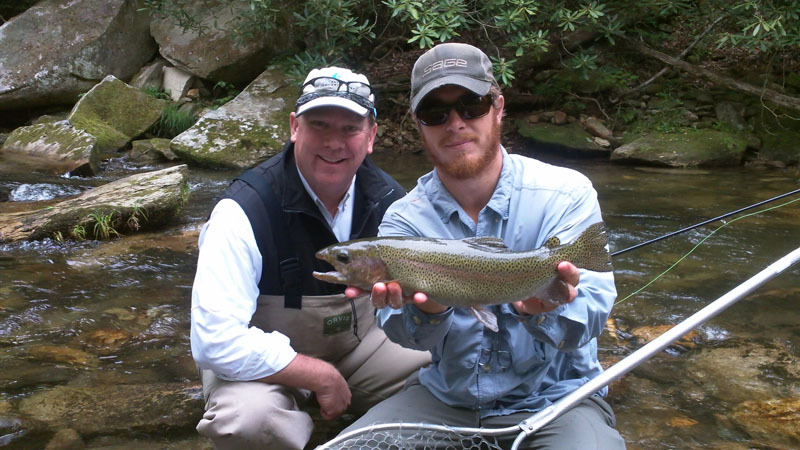 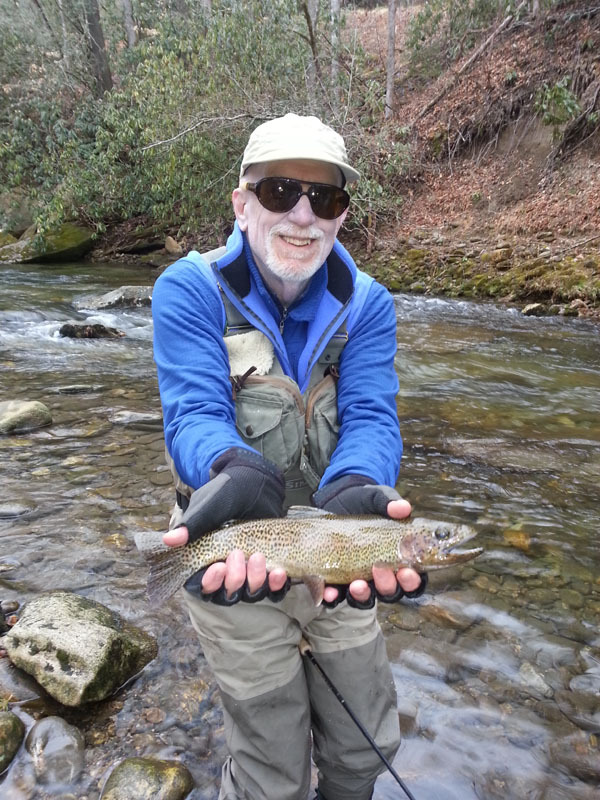 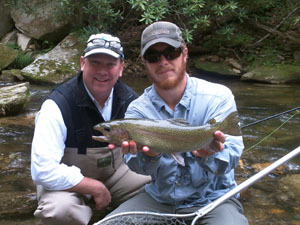 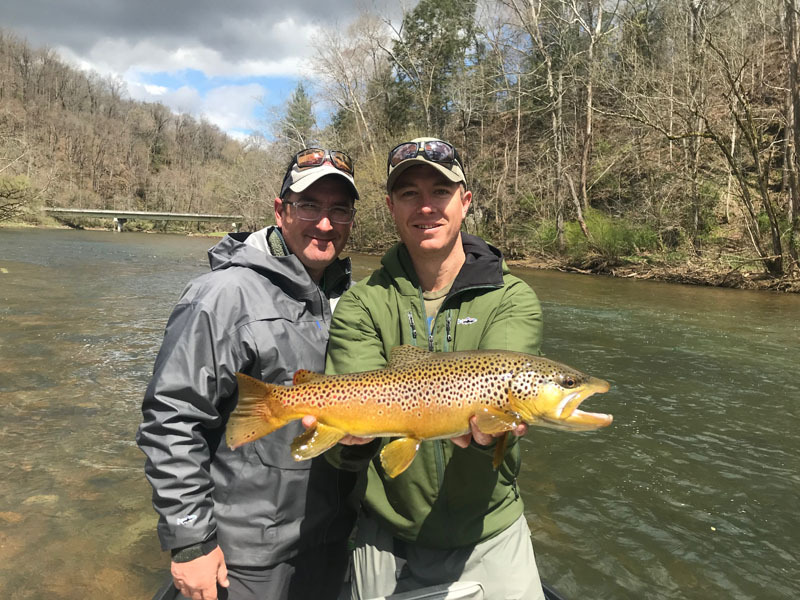 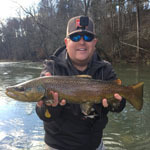 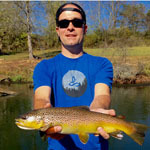 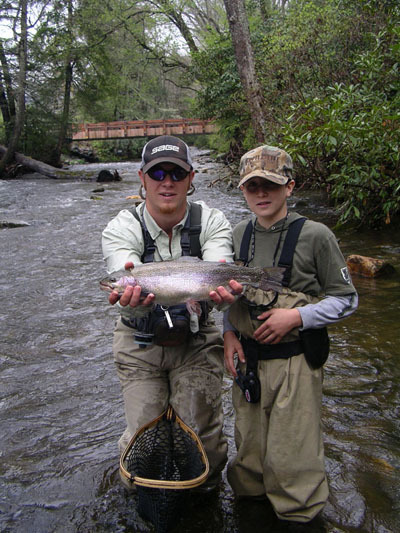 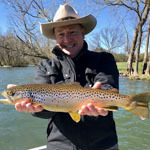 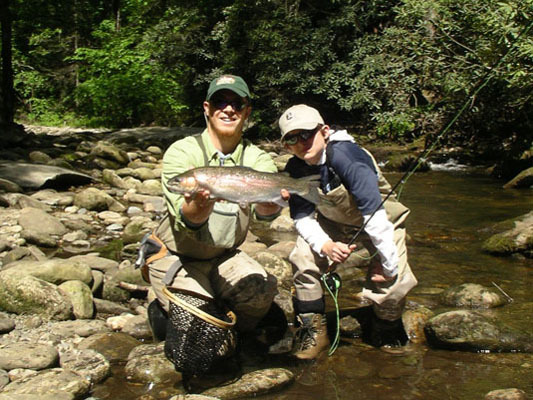 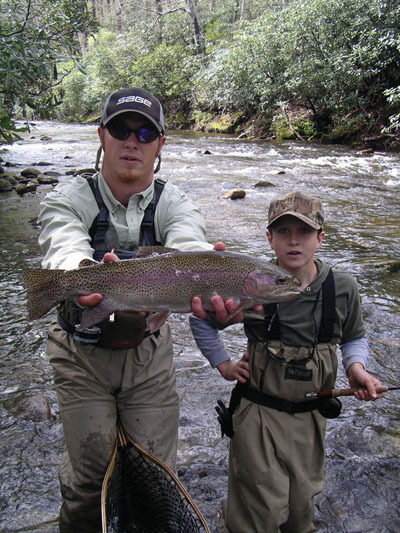 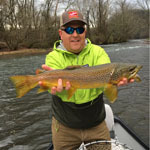 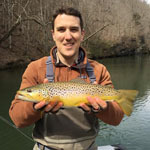 Altamont Anglers guide Teo Whitlock took Bill and Aidan over to the Watauga River on Monday, and they fished the Davidson River yesterday (along with most of the fly fishing population of the Southeast--Spring has apparently sprung). 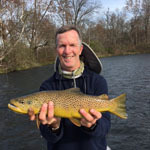 As usual, the assortment of BWO'S, tiny black stones and caddis larvae should be supplemented with a good assortment of midge patterns, #24 to #18.